What makes a house more than just a physical shelter? The old swing on the front porch? The garden in the backyard? The wall clock passed down through generations? We all have furniture, knick-knacks, and other items that represent for us joys and pains, triumphs and tragedies, and the history of our presence in the world. 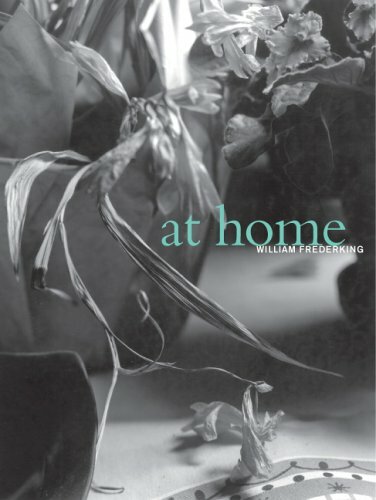 William Frederking takes his own home in Oak Park, Illinois, as the site of such personal talismans, exploring through his photographs the intangible essence of the things that transform a house into a home. In striking black-and-white still-life portraits, Frederking captures the small and large elements that define the spirit of his home, as well as revealing why the home is at the heart of the American dream. Home is a place where objects become enlivened and symbolic—a newspaper lying askew on the kitchen table, a fluffy bedspread spilling through the iron lattice of a bedframe, a staircase spiraling down into mysterious shadows—and thus affirm our existence. Everything we buy or touch, renovate or borrow becomes a mark of our selves, and these marks are nowhere more concentrated than in the home. Frederking’s powerful visual sequence examines the simple backdrop that anchors our complicated lives—and ourselves. A moving photographic chronicle of the materials that shape the home, At Home offers an intimate and graceful meditation on the fragments and ephemera that help us navigate the world.